The decorated pathway through the Park Street Mews complex was graced by a fairly unusual sight recently. To put it simply, ‘Duraiswamipillai’(Durai) the comical lead of ‘He Comes from Jaffna,’ directed by Jith Peiris, had landed in Colombo once again. He wasn’t alone though and was followed around by the rest of the troupe, who were dressed to suit an era long gone. The minute ‘Durai’ gets onto the walkway he draws a lot of stares. 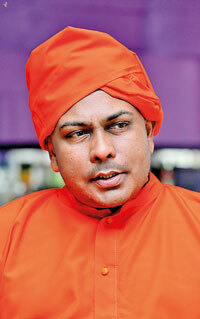 But Anuruddha Fernando was in character and he owned it. This is Anuruddha’s fourth time portraying ‘Durai’ and as he puts it, his character is a very economical man who tries to cut corners with everything. He carries with him an ideal of hoarding things and tries to save all the good things in life for the next generation. The only flaw in this plan is that at the end of the day, nobody gets to enjoy them. The production itself provides immense entertainment to anyone who comes to see it. And this tallies perfectly with Anuruddha’s philosophy in life, a firm believer that laughter is the best medicine. “It’s not about the drinking, smoking or whether you exercise. It’s about whether you’re happy or not at the end of the day,” he says. 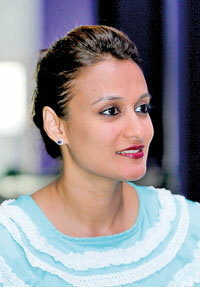 When it comes to Marion Rajaratnam, the young English wife from Raja’s second marriage, portrayed by Swasha Malalasekera, is the only character who is not from Sri Lanka. To Swasha the interesting thing about ‘Marion’ is that “she’s very happy go lucky” and this is just what she likes about her. In terms of the production itself, Swasha explains that it uses real notions of a different time and the older audience would definitely relate to it. She also adds the younger audience will definitely enjoy the humour it packs. ‘Appa,’ Danu Innasithamby yelps whilst seating himself on a bar stool. “Nice boy men,” he tells us as we talk about his character ‘Aru.’ Durai’s problem is that he’s very demanding. ‘Durai’ wants ‘Aru’ to be a lawyer and do well, but he also doesn’t want to spoon feed him. Danu finds himself relating to the fact that ‘Aru’ had no choice but to please his parents. “I also come from Jaffna noh men. It’s the truth.” Of course Danu was rebellious from an early age and that’s why he was able to do what he wanted. Portraying the character ‘Jaffna boy’ from the famed series has also enabled Danu to bring in certain words that is unique to a lad from the north. Words like “Enna appa” are ones that are rooted in local Jaffna culture and Danu uses them to make ‘Aru’ more authentic, he explains. The fact that this play was set in 1908 and that it is still relevant will show the audience that Jaffna has a lot to offer. “It has the sandy beaches, the clear blue water and that calmness and serenity surrounding it. 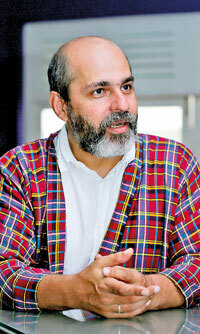 It’s time that we embrace it once again,” he tells us. ‘He Comes from Jaffna’ is an ongoing beautiful piece of cinema that portrays a time period where people actually behaved like the characters in the play. But, as the cast show us, the deeper message embedded in it is that sometimes it’s ok to have a bit of fun in life too, as opposed to living rigidly. And that lesson will hold true for the generations to come. About embracing people for the diversity they bring to the table. And at the end of the day that’s what makes the world go round.